I'm feeling a bit under the weather, so unfortunately there'll (probably) be no posts this week. I have been drinking copious amounts of hot chocolate to cheer myself up. Over the past few years I've pretty much bought all my music over itunes, so what I'm left with is the relics of my childhood and teenage years. That's my excuse anyway. I'm going to try and vlog a little when I'm in Newcastle tomorrow, so be sure to subscribe to my YouTube account for direct updates. Hope you're all good and I promise to catch up with you all soon! Feel better. I want a hot chocolate now. Hmm my CD collection is slightly cringey and I don't even have any downloads to improve things! Got all the S Club 7 ones I haven't the heart to throw away- anyway I may make my students dance to them sometime! They still know the most popular songs. "Reach for the stars...." That's my excuse. I hope you get well soon! I've been using my archive pictures to keep my blog running because I too feel awful this week! Might have to take a load of pictures over the weekend to build up supplies again! uh...winter blues...if you'd like to talk openly to a starnger (which sometimes is amazing and theurapetic because you can really BE yourself) feel free to write me!!!! we can talk and support each other!!! 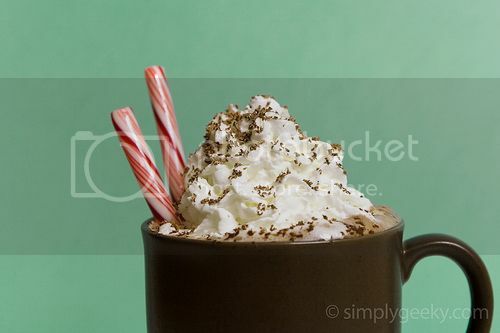 that hot choc looks so good! and i will definitely be trying out those cookies this season! love your blog header too! You look cute, by the way!